Map of the Ancestral Domain derived from the 3-D model and complemented with GPS readings. 1:5,000 scale model of Coron Island, Palawan, Philippines (Yr 1998) manufactured by Tagbanwa people to support their claim for ancestral domain rights. The domain includes terrestrial and marine components and covers a total area of 22,284 hectares. The model has been instrumental – among others – in gathering evidence supporting ownership of the ancestral domain (terrestrial and marine), delineating boundaries, filing the CADC and subsequent CADT applications and preparing the Ancestral Domain Management Plan required by law. 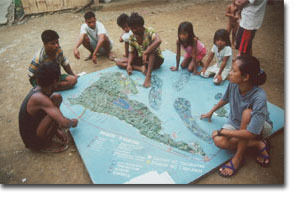 Model and derived map produced by Tagbanwa People in the Philippines with the assistance of the Philippine Association for Inter-Cultural Development (PAFID).